such as Drag-sort playlist, A-B repeat, and Music share. Also it supports many audio file formats that the standard music player doesn't support. Drag-sort playlist -- You can change the playback order of the songs in the playlist easily by dragging the list item. A-B Repeat -- You can specify the start position "A" and the end position "B", and then repeat between the position "A" and "B". Music share -- You can send the selected audio file via Gmail, Bluetooth or the other applications. Stereo VU meter -- Indicates the sound level for each channel. Support for an equalizer application -- In combination with "Fun Audio Effector", it will provide outstanding performance. 1. This application periodically requires a network connection for a license check only. However, once validity of the license is confirmed, you can use the application without a network connection for a few days. 2. Network streams are not supported. You can start playback by touching a song in the track list. 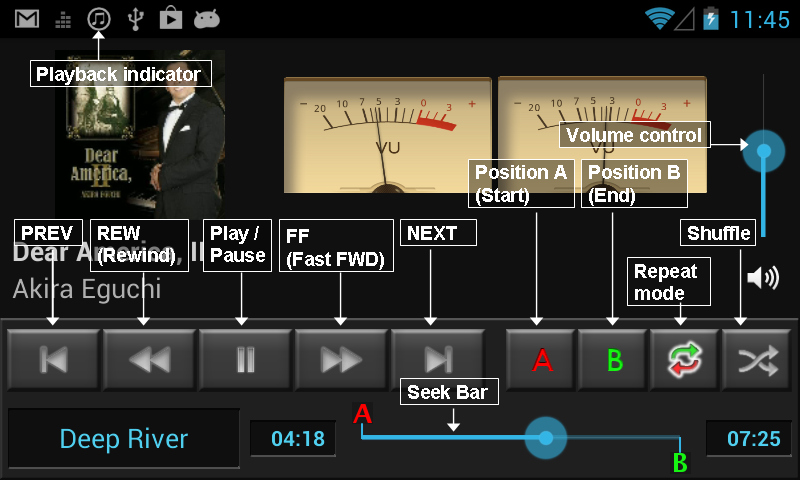 Touch the FF button to move the playback position forward by the specified seek time. Touch the REW button to move the playback position backward by the specified seek time. The default seek time is 10 seconds. You can change the seek time from the settings menu. Touch the NEXT button to skip to the next track. Touch the PREV button to move to the beginning of the current track. Touch the PREV button again within 2 seconds to skip to the previous track. Touch the A button to set the current position to position "A"
Touch the B button to set the current position to position "B"
These buttons are enabled only in A-B repeat mode. The position "A" and "B" can be reset by touching & holding the A and B buttons, respectively. All the tracks in the playback queue are played. After that, playback stops. All the tracks in the playback queue are played repeatedly. Playback between the position "A" and "B" will be repeated. Touch to toggle shuffle mode on/off. If shuffle mode is on, tracks are played in random order. Context menus contain tools that apply to a specific item on the screen. Touch & hold an item in the list until the menu opens. otherwise all the songs associated with the selected item are added. You can send the selected song via Gmail, Bluetooth or the other applications. You can exclude the selected song from the list. The excluded song (audio file) is not deleted. You can recover the excluded songs anytime from the settings screen. You can create playlists to organize selected songs into sets of songs, which you can play in the order you set or in a shuffle. 1) Touch "Add to Playlist" in the context menu (See "2. Context menu") to open the playlist menu. 2) Touch "New playlist" in the the playlist menu. 2) Touch a playlist you want to add in the the playlist menu. 1) Open a playlist library by touching "PLAYLIST" tab or swiping left a main screen. 2) Open a playlist by touching the item you want to open. 3) Drag a song up or down to change its order in the playlist. Touch the Refresh icon to refresh the music library. Usually, the music library is automatically refreshed when the USB storage is updated. However, some systems may not refresh the music library automatically for some reason. So you may need to refresh the music library manually. Touch the Settings icon to open the settings screen. You can select the seek time (5sec, 10sec, 15sec, 30sec). If checked, two lists are shown on the same screen. You can play audio tracks of the video files that have selected formats (3GPP, AVI, DivX, FLV, MP4, WMV, etc.). These video files are added to the music library, and can be played as an audio file. You can show the excluded file list, and recover the selected files. Usually, you don't have to change this setting. Uncheck only when you have a problem with your equalizer application.